Join Portland Public Library for a multicultural evening of performances by immigrant artists hosted by African Dundada. The evening will be held during First Friday Art Walk and designed for audience members to stop by for a few performances or to stay for the entire show. It will be held in the Library’s atrium. Veeva Banga. Veeva was born in central Africa. She started dancing at Mayo Street Arts when she was in 8th grade. She has been involved in Portland Youth Dance, Sudo, a south Sudanese dance group, and currently she works as an African dance instructor at Mayo Street Arts and Hustle & Flow and performs as a soloist. Acholi Dancers – Vicky Peter, Stella Otim, Stella Hermon, and Amal Angelo. Dance is one of the most fundamental parts of the cultural heritage of the Acholi Tribe of Northern Uganda. Traditionally in the Acholi culture communities incorporate dance into their rituals and celebrations. Clothing and adornments such as anklet bells and beaded necklaces are an important component of the dances in addition to the musical instruments that are played. AD.vs.FX is a performance duo featuring live improvisation with bass-heavy dance-beats. SolNiJha has been performing for most of his life and has opened up for artists such as King Yellowman, Toots and the Maytals, The Wailers, Jimmy Cliff, Third World, and JBoog. Bondeko is the coming together of three generations and three distinctive musical lineages from three very different life journeys…unified by the experience of migrating to America. Bondeko fuses eclectic rhythms from Albania, the Democratic Republic of Congo, France, and other global genres. Band members have four languages spoken between them…oftentimes with only a dozen words understood through that, their music exemplifies the unifying power of artistic expression, experience and global connection! African Dundada was born in 1990 to the Acholi tribe in Pajok County in Southern Sudan, amidst the brutal beginning of The Sudan’s Second Civil War. His parents fled with him and his eight brothers and sisters to Uganda where they eventually made their way to a refuge camp. His mother was left alone to protect and feed her children while his father traveled to Kenya, seeking a permanent and more suitable life for his family. African Dundada spent most of his formative years, nearly a decade, in the camp. There was never enough food or medicine. It was the only life he knew for eight years. He remembers the hardships, and most of all the hunger, but he also carries memories of laughter, of hope and of community. The political and economic turmoil persisted in Sudan, as well as many other countries on the African continent, making life outside the refugee camps far more perilous than the life within. Finally, in 1998, the family made it out of Uganda and was given refugee status in the United States and made a home in Portland, ME. 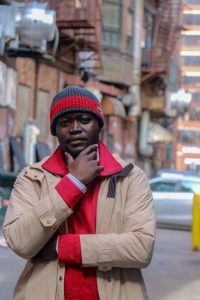 With his music AFRiCAN DUNDADA wants to raise both awareness and resources for the millions still struggling to survive in the fractured aftermath of the conflicts and ever present shortage of foods and supplies, education and opportunities. It is his plan to return home to Africa eventually, bringing relief, hope, and music.